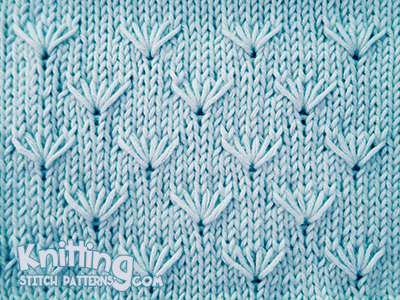 Flower: Insert right-hand needle into the third stitch down from the second stitch on left needle (this space forms the centre of the flower) and draw through a loop, leave loop on right-hand needle and knit 2, make second loop into same stitch, knit 2, make third loop into same stitch. Knitted in a multiple of 8 sts + 1 and 12-row repeat. Row 5: K3, flower, * k4, flower; repeat to last 2 sts, k2. Row 11: K7, * flower, k4; repeat from * to last 2 st, k2. Row 12: P6, * (p2tog, p1) twice, p2tog, p3; repeat from * to last 3 sts, p3. Knit: K | Purl: P | Purl 2 sts together: P2tog.